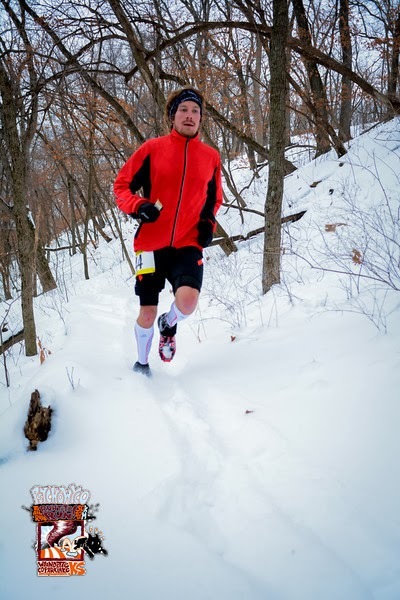 My season opener at Saturday's Psycho WyCo 50k race was a study in snow running. Lucky for me, I've been running in snow all winter long, like most of us in the Midwest. It made for a grueling race (and a rather slow time), but it was a great, longer-than-anticipated training stimulus, perfect for building strength and endurance. I put Psycho WyCo on my calendar a few months ago after my friend and Salomon teammate David Wakefield recommended I come out for a visit and the race. It's put on by his friend Bad Ben Holmes and the Trail Nerds (they do a whole series of events, which seem pretty great). I also had my eye on Scott Gall's course record (3:59:11) and a sub-4 hour time, which combined with a win, would have netted a handsome payday for an early season race. But when Kansas City was saddled with a heavy dose of snow early last week, I figured any record attempt would be off the table. I was still looking forward to a fun race, as Gall was slotted to defend his title and my friend Mark Thompson (2012 and 2013 Fall 50 winner) was also coming down from Iowa. Unfortunately, Gall decided not to race. The course consists of three 10.35 mile loops, with a fair amount of vertical for what one typically thinks of when thinking of Kansas. The trails are also apparently fairly technical, though the snow pretty much removed this element. In the early miles, I found myself in a lead pack of five, including Mark and a few local runners. Our pack kept the pace relatively easy, breaking trail through 8+ inches of snow. I was content just to sit and wait until the second loop to inject some real effort. But when our pack surprisingly broke up on the climb to the dam (about midway through loop 1), I found myself in the lead with a small gap. I figured why not press a bit, so I began to push as we entered the far section of the course. The snow was deepest here due to drifting, and completely untouched in spots. This was probably the most fun of the day for me, as you could just fly down steep descents through drifts of snow. I knew that by the time I began the second loop, several hundred people would have been over the trails. In years past, this has packed the snow into a very runnable track, making the later loops much easier. Unfortunately, since the weather had been so cold, the snow was very dry and it did not pack well. Thus, the second and third loops weren't really much easier; even though the snow had been run through, you would still slip and slide on basically every step. 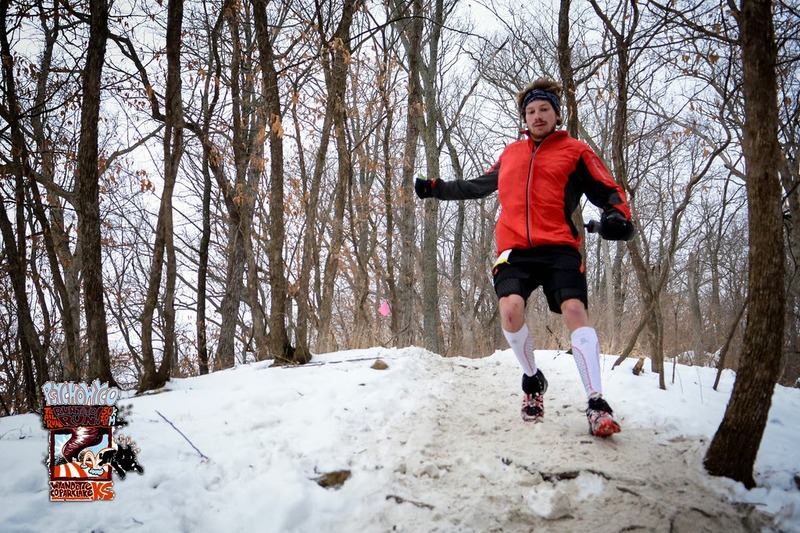 I had my Salomon Spikecross, which leant about as much support as a shoe could in such conditions, but there was just no avoiding the feeling of running two steps forward and one step back for the entire race. After a 1h38m opening loop, I pushed pretty hard on loop 2. I wanted to make sure I got at least a sub-5 hour finish, as that also had a cash bonus. It was probably a bit too much, as I was getting very muscularly tired by the end of that loop, especially my hip flexors. But it was also fun, as I continued to really enjoy the steep descents and tight corners in the "Triangles" section of the course. I hit a 1h32m split for loop 2, which actually would have won the 10 mile race as well; so that was kind of a fun accomplishment—running the fastest loop of the day for all races. I was pretty spent heading out for loop 3, and I remember thinking 'man, if this was a training run, I would have zero will to go on right now.' I thought back to a training run in early January on similarly snowy trails in Michigan. I had gone out for a planned 17 mile run, breaking trail through 6-8" of powder, and I had to cut it short, managing only 13.4 miles in 2h14m. And that's why races can be great for training efforts, especially for ultra marathoners. You can often do in a race situation what you can't do in training. It's a balance of course, and you can't "go to the well" too often, but used properly, races can be great training stimuli. I think Timmy Olson is a good example of this. 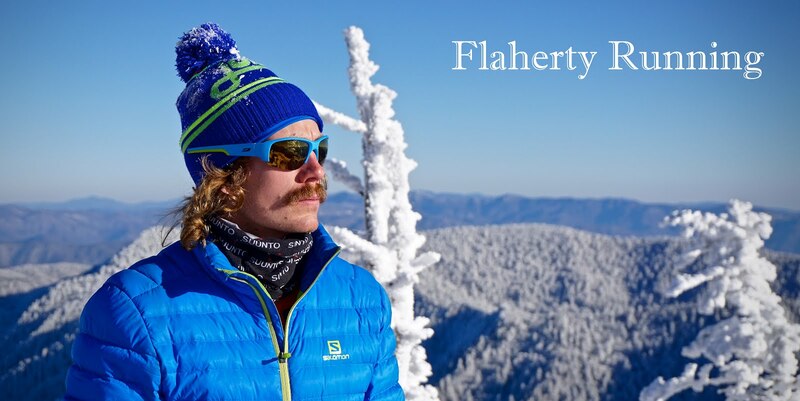 You see him hop in a lot of 50 mile races where he really isn't competitive most of the time, but I think that's by choice—he seems to run them at about 95%, knowing that he can only go big a few times per year, like at Western States or UTMB. I got through loop 3 pretty uneventfully in 1h37m for a final time of 4:48:13 and a victory in the 50k. Mark came in second in 5:22:18, with Jeremy Morris rounding out the men's top 3 in 5:30:14. Shortly after I crossed the line, Bad Ben handed me a beer, which I welcomed gladly. David was hanging out as well, having just run the 10 Mile himself. 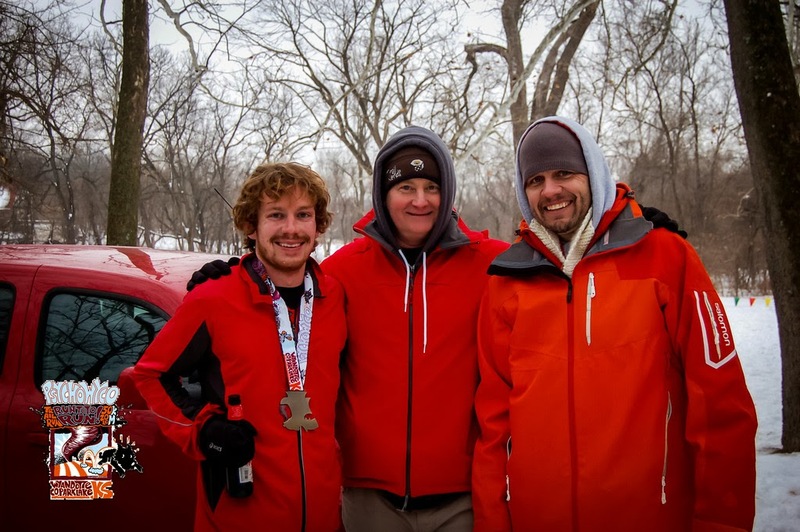 He was helping to hand out medals and awards, so I got to chill for quite a while post-race, watching the lead women and other competitors come in, and enjoying a number of beers and some great homemade chili. Bad Ben is a rather accomplished homebrewer, and he had a great IPA and dry-hopped saison on tap for all competitors and spectators to enjoy! It was fun to chat with some of the locals about these trails and the other Trail Nerds races. I owe a big thanks to David for hosting me, Bad Ben and his crew for putting on a great event, Beth for crewing for me, and also to my sponsors for their continued support. I couldn't asked for a better season opener. 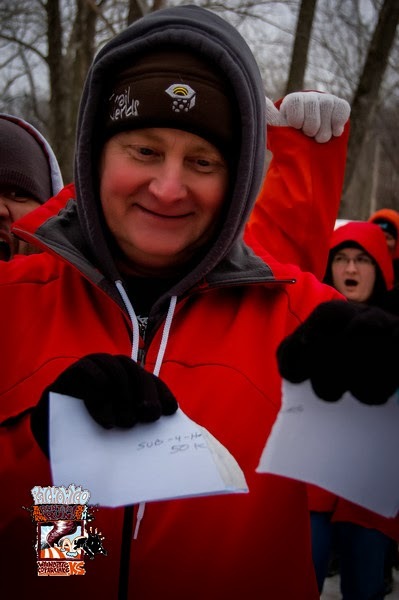 It was a lot of fun, and it's got me excited for the coming year! Next up is the Napa Valley and Boston marathons in March and April. Congrats!! Rebel IPA? Have a 28 snowy trail training run tomorrow and that will be the reward. It's 4 loops, so will need to summon will power. Keep up the great results, and have a fun Napa prep.